The Nintendo 3DS is one of the best handheld systems ever made, made even better with the New 3DS iteration (we reviewed the New 3DS XL New Nintendo 3DS XL Review and Competition New Nintendo 3DS XL Review and Competition The New 3DS XL is here, and it brings some interesting changes – but is it worth upgrading if you already have a 3DS? Should new users save some cash and buy the older generation? Read More ). From a solid library of first-party titles to a library of old and new hits on the eShop, 3DS owners are never short on games to play New 3DS Your First 3DS? 8 Must-Buy Games New 3DS Your First 3DS? 8 Must-Buy Games So you just got your hands on a New Nintendo 3DS? Now you need games to play. Trust me; you don't want to be stuck with Pokémon Shuffle and Face Raiders. Read More . A great feature of any system is backward compatibility, which the 3DS has. This extends its library by hundreds of games, and lets you enjoy anything you missed out on during the last handheld generation. While the 3DS has brightness settings built into its menu, including adaptive brightness, there’s no evident way to adjust the brightness when you’re playing a DS game. This is because you can’t access the 3DS home screen from DS games. However, there is a way to adjust the brightness of DS games on 3DS. Annoying thing about playing DSiWare and DS games on 3DS: Can't change brightness without exiting out of game completely. While this method isn’t explained anywhere we know of, it’s simple to perform. While playing a DS game on 3DS, press the Home button, which will ask if you want to return to the 3DS home screen. Here, press and hold the Start button, then use Up and Down on the directional pad to adjust the brightness between several different levels. Cryptic, huh? This is the type of command you wouldn’t discover unless you already knew about it. Now that you know it, you don’t have to go blind while playing at night or squint to see the dark screen outside. Only playing DS games on your 3DS? You’re missing out! Check out the best uses of 3D in 3DS games 4 Nintendo 3DS Games That Make Incredible Use Of The 3D Tech 4 Nintendo 3DS Games That Make Incredible Use Of The 3D Tech The 3D in the 3DS isn't just there for show. It's actually a key part of the console that just isn't used by enough games. However, there are some games that take the 3D technology... Read More . What DS games have you been playing on your 3DS? Let us know if this method helped you in the comments! Explore more about: Nintendo, Troubleshooting. Assassin’s Creed Unity Is Free on PC (Temporarily)PlayStation Now on PC: Is It Worth It? 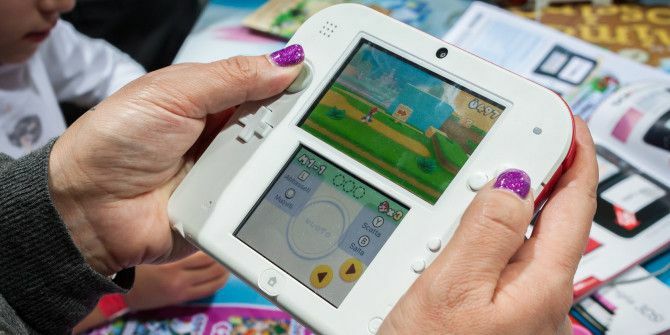 New 3DS XL vs. New 2DS XL: Which is the Best Portable Nintendo?